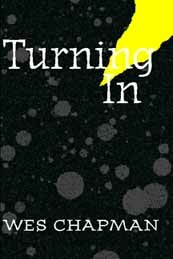 Eastgate Systems announces the publication of Wes Chapman's long-awaited hypertext, Turning In. Stories don't push cars in the snow. That is one of their sad limitations. I send this one out anyway, hoping that someone can make use of a smaller, more delicate hand. In this hypertextual coming-of-age novel, Adri Sumner's wish to forget his troubled childhood paradoxically launches him on a journey of self-discovery. His quest takes him through suburban pizza parlors, Ivy League parties, a brush with the penal system, and an adventure in courtroom deconstruction. "Because this fiction is in no small part about the very act of finding form, it wanted a form which was precise, crystalline, yet also capable of permutation and offering as much random access as the pages of a book... I did not yet want to learn an art that would change the world, but the world changed and I have changed with it." -- from Wes Chapman's essay, On Changing With, included with Turning In. Wes Chapman received his Ph.D. in English Language and Literature from Cornell University in 1992. While attending Cornell, he was introduced to Nancy Kaplan, who was then head of Cornell's Writing Workshop. When he mentioned his interest in experimental literature such as Euphues, Tristram Shandy, The Yellow Wallpaper, Ulysses, and Gravity's Rainbow, she replied, "What's experimental about those?" and showed him an early version of Michael Joyce's afternoon, a story. Chapman is Associate Professor of English at Illinois Wesleyan University. Turning In is his first hypertext.